Right now we are waiting for new Marissa WEATHERHEAD Art to arrive at the gallery. In the meantime, here is a selection of the artist's archived art work which has featured at Red Rag Art Gallery. If you wish to register to receive updates and alerts when new art work from Marissa WEATHERHEAD arrives select this link. Marissa Weatherhead was born in Brighton in 1962 and then spent her early childhood in Sri Lanka. The beauty and excitement of a vibrant, tropical country during Marissa's formative years and influenced both her palette and the subject matter of her paintings. Marissa Weatherhead initially trained at NCAD and then later at Gloucestershire College of Art and Design where she gained a BA with first class honours in Fine Art. She then went on to receive an MA at The Royal College of Art in London. Using a variety of mediums, Marissa Weatherhead will often flatten or fragment an image, drawing from knowledge and understanding of her subjects. Her paintings evolve as she continues layering and marking to develop texture and form until the image is mature and carefully crafted.She manages to skillfully combine sensitive delicacy of form with boldness of outline to create art works that are both gentle and striking. 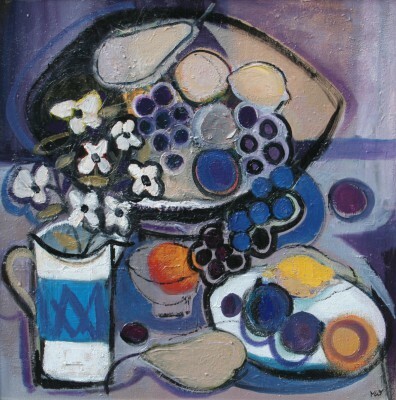 She paints still life pieces in a structured approach, which shows off her impressive technical skill. Marissa often uses subdued backgrounds of blues, greys, and even black but uses careful, broad lines, and brighter shades in the body of her paintings. Though she often uses colour, she also has done work in black on light backgrounds, using swirling lines and negative space to create the image. Marissa Weatherhead paintings are held in many public and private art collections including the Guildhall School, London. In addition to Red Rag Gallery Marissa Weatherhead art work has been exhibited at other leading British Art Galleries. Each painting at Red Rag is sourced from the Marissa Weatherhead artist studio and like all Red Rag British art and Contemporary art it can be shipped worldwide.